If you’re a Delhi bird, you may be a bit lost in this neck of the woods. Which is why we put together a handy list of all the cool places in G-town that deserve to be checked out. When food and drinks are on your mind, you’ll find the best places in Sector 29, Ambience Mall, Galleria Market and Cyber Hub. If hunger kicks in late night, head to All Time Cafe in Sector 49, a chill space that’s open 24/7 and has awesome shakes and a gaming area. People And Co. is a great option where you can snack while stand-up comedians from the Canvas Laugh Club leave you in splits. We also suggest checking out Cafe Soul Garden in DLF Phase 4 which doubles up as a co-working space and hosts regular open-air movie screenings (it’s pet-friendly too!). You can keep an eye on their latest events here. Up for something more action-packed? Head for go-karting at F-9 Go Karting, a multi-level track that adheres to strict safety standards or to Frenzy Adventure Zone on Sohna road that covers activities like zip-lining, bungee-jumping, net cricket and wait for it...skyrocket ejectors! 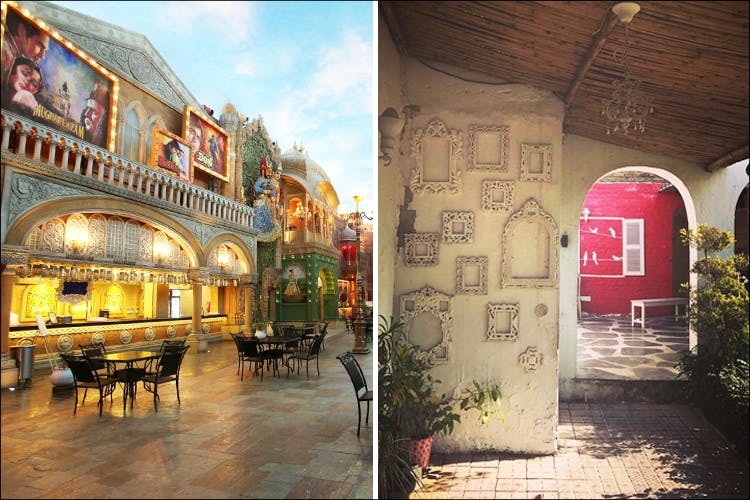 If you’re in the mood for a visual treat, Kingdom Of Dreams has live musicals and regional food stations – it’s an apt spot for a day trip with your friends and fam. More of a sportsperson? Hamoni Gold Camp is an open-for-all space which lets you play golf without any need for membership (with food on the side, of course). Exciting, isn’t it? If you’d rather ditch the heat, then head to awesome water parks like the Fun ‘N’ Food Village on the Old Delhi Gurgaon Road or to Oysters (which is the new name for a revamped Appu Ghar). Also, if you don’t mind a little bum-bruising, check out ISkate for an hour-long session of ice skating. We also suggest making a plan with your gang and heading for indoor gaming centres like Smaaash and OMG – Oh My Game. While MGF Metropolitan mall or Ambience mall are the usual spots for all shopping sprees and family outings, lazy picnics are an option too. We recommend checking out this list of lush green parks or the NeverEnuf Garden Railway, a beautiful space with miniature train sets, remote-controlled boats, cars and ample greens (kids will love this!). You can also spend time bird-watching at the Sultanpur Bird Sanctuary. It’s a fascinating place to be if the migratory season is on. For when you’re alone and hoping for a breather from the usual city humdrum, this list of quiet spots will sort you out. Art and history lovers, we’re not planning to leave you behind. Check out Gallerie Alternatives which displays the works of India’s most renowned artists, like MF Hussain and Abanindarnath Tagore. You can also visit the Heritage Transport Museum where you can witness the evolution of transport-technology at its most fun (they have a tree made of traffic lights!). Shutterbugs, don’t miss the vintage camera museum which has over a 1,000 cameras, ranging in origin from the 1880s to the 1990s. If you’re more the type that loves devouring the rich architecture of monuments, here’s a list of the ones you can visit.